Originally published in 2011 by Hudson Hills Press and now available through George F. Thompson Publishing. Jack Parsons has been investigating the light, landscapes and cultures of the American Southwest for over thirty-five years. He has produced fifteen books, many of which have become bestsellers and classics in their fields, from the groundbreaking Santa Fe Style (Rizzoli), which spawned the hugely successful, international genre of publications based on regional design; to Lone Star Living: The Texas Home and Ranch Book (Bulfinch), and Low ‘n Slow (Museum of New Mexico Press). 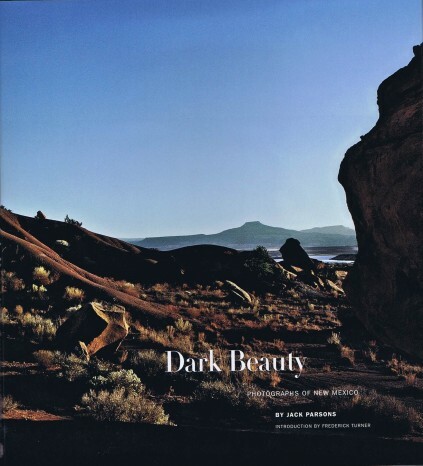 DARK BEAUTY features one hundred of his rarely seen or published photographs of New Mexico. From images of small towns and lonely plains, mountains, rivers, fiestas, and murals, to old adobe houses, crumbling walls and dirt roads in Santa Fe, Taos, and elsewhere, it presents a very personal, elegaic vision of the state where he has made his home since the 1970s. These photographs reveal a deep understanding and reverence for a place whose complex, rich history, unique multiculturalism, and unparalleled beauty continue to captivate residents and tourists alike. A Guggenheim fellow, Frederick Turner has written ten books and edited three,including Beyond Geography: The Western Spirit Against the Wilderness; Rediscovering America: John Muir in His Time and Ours, and the latest, The Go-Between: A Novel of the Kennedy Years.